The Treaty of Ried is signed between Bavaria and Austria. The Treaty of Ried of 8 October 1813 was a treaty that was signed between Bavaria and Austria. 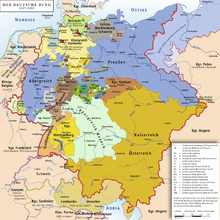 By this treaty, Bavaria left the Confederation of the Rhine and agreed to join the Sixth Coalition against Napoleon in exchange for a guarantee of her continued sovereign and independent status. On 14 October, Bavaria made a formal declaration of war against Napoleonic France. The treaty was passionately backed by the Crown Prince Louis and by Marshal von Wrede. A British and Indian combined force defeats the United States Army in what was called the Battle of Beaver Dams. The Battle of Beaver Dams took place on 24 June 1813, during the War of 1812. An American column marched from Fort George and attempted to surprise a British outpost at Beaver Dams, billeting themselves overnight in the village of Queenston, Ontario. Laura Secord, a resident of Queenston, had earlier learned of the American plans, and had struck out on a long and difficult trek to warn the British at Decou’s stone house near present-day Brock University. When the Americans resumed their march, they were ambushed by Native warriors and eventually surrendered to a small British detachment led by Lieutenant James FitzGibbon. About 500 Americans, including their wounded commander, were taken prisoner. On 25 May 1813, the Americans had won the Battle of Fort George, capturing the fort. The British fell back to a position at Burlington Heights near the western end of Lake Ontario, briefly abandoning the entire Niagara Peninsula to the Americans. 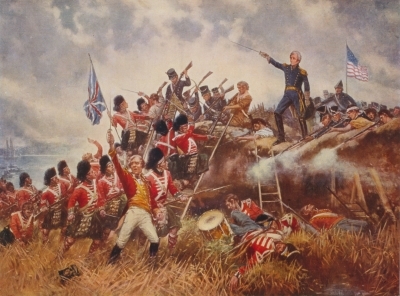 The Americans attempted to pursue the British, but their advance was checked at the Battle of Stoney Creek by a British counter-attack. At the same time, the American flotilla of warships which had been supporting their army on the Niagara Peninsula was hastily withdrawn to face a threat to their own base, and a British flotilla threatened the Americans’ line of communications. The Americans fell back to Fort George. The British followed up and established an outpost at DeCou’s house in the present-day city of Thorold, Ontario, from which Natives and militia harassed American outposts. The American commander at Fort George, Brigadier General John Parker Boyd, decided to clear the threat posed by enemy raiders and to restore his men’s morale by making a surprise attack on the outpost at DeCou’s. The main contingent of Natives were 300 Kahnawake, also referred to as Caughnawaga in contemporary accounts. The Kahnawake were Mohawks who had earlier been converted to Christianity by Jesuit missionaries. They were nominally commanded by Captain Dominique Ducharme of the Indian Department, with Lieutenants Isaac LeClair and J.B. de Lorimier. There were also 100 Mohawks under Captain William Johnson Kerr. They set up ambushes in a thickly wooded area 1.5 miles (2.4 km) east of Beaver Dams. FitzGibbon with 46 men of the 49th Regiment of Foot was in reserve. Early on 24 June, the Americans set out for DeCou’s stone house. At St. David’s they proceeded along a trail at the base of the escarpment until they reached another trail leading up the “mountain”. Reaching the top, they became aware of Natives closing in on their flanks and rear. Boerstler did not change his plans. When the Natives opened fire, Boerstler was wounded and placed in one of the wagons. According to American accounts, they caused the Mohawks to flee and fought their way out of the woods into open fields where they could use their artillery, and the Natives were not at such an advantage. This account is not supported by other witnesses. At this point, FitzGibbon intervened. Addressing Boerstler under a flag of truce, he claimed that the Americans were outnumbered and surrounded, and that if they did not surrender he would be unable to restrain the natives from slaughtering the entire American force. The wounded Boerstler capitulated to Major de Haren of the Canadian Regiment of Fencible Infantry, who had just arrived on the field with another detachment of British regulars from Twelve Mile Creek. The American force surrendered in a field just south of the Thorold Tunnel, east of the present day Welland Canal. The prisoners were escorted first to DeCou’s, then to the British base at Ball’s Falls. he natives admitted to a total of five chiefs and warriors killed, and 20 wounded, although Ducharme stated that 15 were killed and 25 wounded. The American casualty report stated 25 killed and 50 wounded; all of the wounded being among the prisoners, who numbered 23 officers and 489 enlisted men. It was later claimed that many of the wounded Americans were killed by Mohawks. British soldiers burn Buffalo, New York. Napoleon Bonaparte gets his worse defeat as the Battle of Leipzig ends. A combined British and Indian combined force defeats the United States Army – the Battle of Beaver Dams. During the War of 1812 American forces capture Fort George in Canada. Creek “Red Sticks” kill over 500 settlers in Fort Mims, Alabama.